From the proper function of the major organs and the role that proper nutrition plays in their functioning, to a breakdown of carbs, proteins, fats, vitamins, and minerals, Clinical Nutrition For Dummies provides you with the easy-to-read guide you need to immerse yourself in the subject! Written in the fun style that the For Dummies series has become known for, the book is perfect for students in the wide variety of fields that require an in-depth understanding of clinical nutrition, or for those who want to improve their own lives through better nutrition. Dive right into the book for an exploration of the chemical and functional components of food, how to properly assess your nutritional intake, the changing face of nutrition throughout the human lifespan, and so much more! This handy resource offers a wealth of information, and specifically addresses the growing obesity and diabetes epidemics that promise to make the study of clinical nutrition more important than ever. Includes a complete breakdown of the relationship between nutrition and chronic diseases. 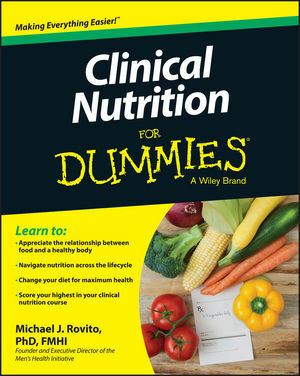 Clinical Nutrition For Dummies is your complete, fun guide to the topic of nutrition—dive in today to get started on the pathway to mastering this increasingly important subject. Michael J. Rovito, PhD, is Founder/Executive Director of the Men’s Health Initiative. Dr. Rovito specializes in male health promotion, chronic disease epidemiological and behavioral research, and community-based wellness interventions. He steadfastly supports the notion that proper diet and exercise are the best and safest ways to achieve optimum wellness.